The desktop publishing software give you the most powerful ability to create stunning Brochures, Flyers, Letterheads, Address labels, Business Cards, Envelopes, Announcements, Newsletter, Leaflets, Posters, Advertisement, Invivations, Menu etc..
With the program, select one of the many attractive predesigned and fully-customisable templates to start your work, Simply add your own images and text for the fastest way to create amazing digital publishing. 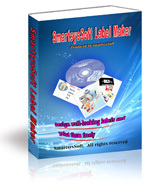 SmartsysSoft Business Publisher also offers drag and drop graphics, images, shapes, logoes and more, with a powerful graphics organiser and manager so you can find what you want when you need it. Photo editing and vector graphics creation tools are included with built in the program, so you can complete entire projects in this one package. Promote your business or club with posters, brochures, flyers, advertisement and newsletters. 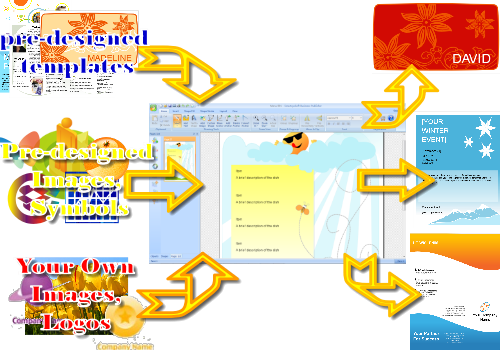 Create business stationery and documents and from a wide range of attractive templates. Design professional vector graphics and edit photos or images in one packet. Print your publishing material on any local Windows compatible printer with maximum output of 600 dpi. Save your design as a high quality images with PDF, BMP, JPEG, GIF, PNG, PCX, TIFF formats for outside quality printing. The application's interface is attractive and quite intuitive, and most users should be able to start making their designs within short times. With moving mouse button you can create, move, resize or rotate each drawing objects visually and freely. Undo redo anytime anywhere if it’s needed. 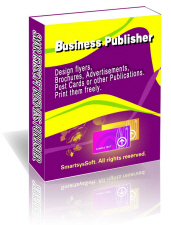 SmartsysSoft Business Publisher suits to desktop publishing for home, small, medium size business and organizations, whether you are a small real estate business, Institute, Showroom, Fashion Industry, Artist, Retailer, General Store or some kind of club, hotel or event organizer you can find templates and designs in it that fits your need. And even if you like a publishing design in some other business category, you can still customize it to make your own flyer, brochure, posters, advertisement and other publishing material.